According to the first and the second Euclidean postulates, two points are joined by a straight line segment that can be extended indefinitely in a straight line. 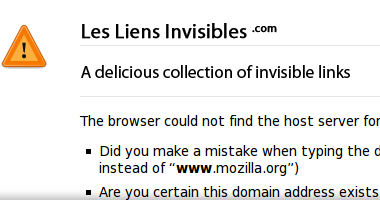 Les Liens Invisibles .com is the homonym, self referential, ongoing collection of invisible | broken | non-existent | conceptual | zen links by the imaginary art group Les Liens Invisibles. Visitors are free to browse around the collection following both the notworking and the conceptual connections.